Berkeley Reed caught this 63-inch Gar on the Cimmaron River in Oklahoma. It is the new state record Gar Fish. This young man went out fishing on Saturday for fun and came home a state record holder. Berkeley Reed caught this 63 inch Gar with travel hooks on the Cimmaron River in Oklahoma on Saturday, April 12, 2014. The Gar is one inch longer than longer than the previous state record and is now the new Oklahoma State Record Gar. While Reed did not have a scale handy, we can tell that this is a great fish. 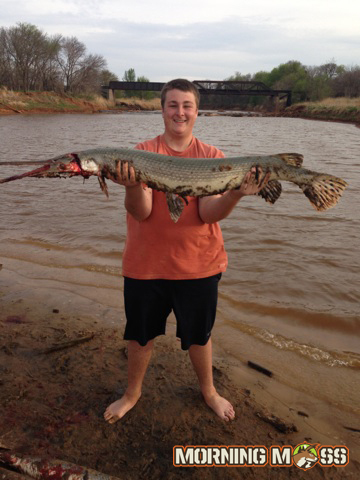 Congratulations to Reed on this awesome catch and new Oklahoma State Record Gar. Hopefully he’ll have many more to come. Please send us your fishing and hunting photos and we’ll post them up here on the site.